So, I just finished a sermon series on facing your fears. It is strange to think how often Christ followers struggle with fear, considering He’s …you know, Sovereign and stuff. For many, a spirit of fear becomes the voice replacing the Spirit of God in ways that are clear and overwhelming. The more we engage and obey the voice of fear, the louder it becomes, backing us into isolation and paralyzation. It’s our enemy’s most potent ammunition. Unfortunately, after preaching my last sermon in the series, I fear I may have just given people a fear of having a spirit of fear. :-/ I thought it might be helpful to give a few suggestions on how to overcome a spirit of fear. Through personal bouts of discouragement and depression, I have tried some things that helped, and others that didn't. Having a pity parade. Not helpful. While it is certainly nice to share your fears with others, wallowing in them like a pig in mud just exacerbates the problem. Sometimes when we don’t feel affection, we are tempted to settle for attention. Having friends who don’t at least gently challenge you, may make you feel justified in your pity, but it won’t help you out of it. Recognize the poo, don’t roll in it. Isolation. This one feels like it will help. If I just get away from all the things and people that could potentially hurt me, I will be okay. Unfortunately, it also cuts off the most potent means of healing: Relationships. The more you buy into avoidance as a legitimate lifestyle, the more possibilities, and learning experiences are limited if not eliminated all together, causing fear to reign supreme. See Howard Hughes. Brilliant dude …whose paranoia drove him to living in a hotel room, eating chocolate bars, and watching movies naked in the dark, only cutting his nails and hair once a year. Put down the Hershey’s, and back away slowly. Feel it, and then disobey it. You can’t help how you feel, but you can decide to trust God anyway. It’s very rare that a feeling of courage precedes a courageous action. Most often you must choose courage in spite of fear. Anyone who doesn’t experience fear at all is probably a danger to himself and others. Fear is a natural feeling, causing us to pause and reflect. However, if all you reflect on is your circumstances, you have given great fodder to a spirit of fear. Pause and listen to your Father. Reflect on His character and His word. Allow God to shepherd your feelings. Stop reading that Awesome Dad/ Super Mom/ Messianic Pastor/ Paleo-Vegetarian Marathon Runner blog. I am the worst at comparison. If I cant be the best, I often assume I’m the worst. Lets just acknowledge there are some people who are better than the rest of us. You don’t need to be them. Comparison kills courage and paralyzes you from action. Pretty soon you find yourself doubting even the things you’re good at (like not ending a sentence in a preposition.) Don’t try to be a GREAT dad, just love your kids with what you have to give. Sometimes obsession with being great, can keep you from being present. Quit Pinteresting every meal and project. Try something different that might be terrible (or awesome.) Then put it on pinterest. Do one simple thing that scares you a little. 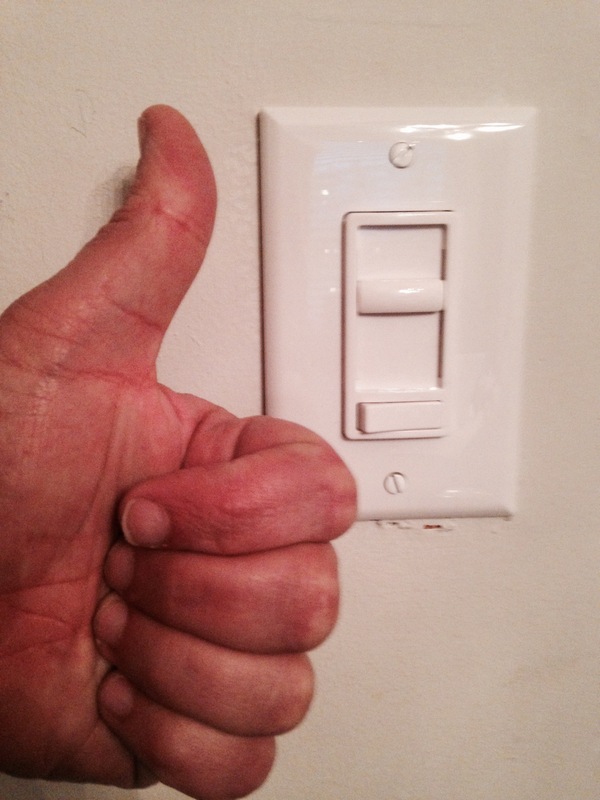 Last week I installed a dimmer switch, and two doorknobs. Yes, I know you are impressed. I was scared. I was afraid I couldn’t do it. What if I drilled the hole in the door wrong? What if I attached the wrong wire? What if I forgot to turn off the power, and shocked the snot out of myself? (Ok, that last one is a legitimate fear. I checked it twice.) It is amazing how much learning a new skill and completing a simple task can feel like a spiritual experience for me. It directly confronts self-condemnation and hopelessness and kicks them both in the teeth! You will fail at 100 percent of the things you don’t try. If you succeed at half of what you do try, you are coming out way ahead. See, I can do math too. My temptation is to want to solve all my problems at once, rather than just start small, but it’s more often like a snowball that starts little and picks up size and momentum as it rolls downhill. What have you done to overcome fear? Share some things that worked for you.